Swing the Circle Golf School was founded by Jimmy Stewart based on the teachings of Wally Armstrong. A lifetime student and teacher of the game, Jimmy has long studied the masters of the game implementing the simplest and most effective teaching techniques in order to make the game as easy to understand as possible! Jimmy's on-going search led to Wally Armstrong who for many years has been recognized by his peers as one of the most creative teachers in golf. Gary Player calls Wally, "the true master at teaching the feel of the golf swing." Jimmy and his two sons, Rick and Daniel, both PGA pros themselves, have therefore partnered together to offer the Swing the Circle Golf School in beautiful Sonoma wine country in Healdsburg, CA, as well as at their other properties in the North Bay Area. For those wanting to learn to "feel their way to better golf" or just enjoy a fun, entertaining wine country golf school, please call (707) 799-4263 to sign up. Besides Swing the Circle Golf School, in a desire to see these simple swing concepts communicated to a wider audience and a new generation of golfers, Jimmy & Team have updated and re-mastered into DVD format Wally's famous "Maximize Your Game" videos, one of the most popular golf instructional series in history with over 400,000 copies sold into. 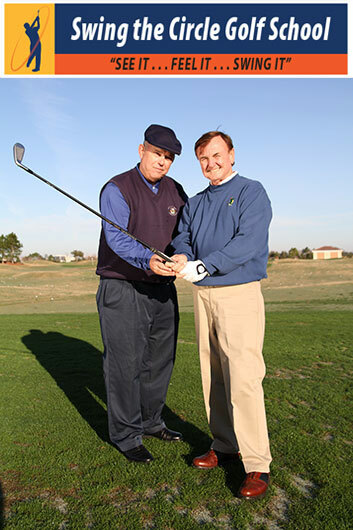 Wally & Jimmy have also filmed a brand new DVD entitled" Swing The Circle" which focused entirely on the central truth that the golf swing is a circle, the heart of all Wally's instruction these past 50 years! Wally Armstrong is a 1966 graduate of University of Florida with a Bachelor's and Master's degree in Education where he also earned All American honors in golf. A lifetime PGA Tour member, Wally has competed in more than 300 PGA Tour events in his career including numerous British Opens, Masters, U.S. Opens, PGA Championships and Tournament Player's Championships. In his first Master's, Wally finished fifth setting a rookie scoring record of 8 under par at the time. Wally's lifetime on the PGA Tour and as an Educator has given Wally a unique perspective and emphasis on using visual imagery through the use of familiar objects such as baseball bats, brooms, hula hoops, hockey sticks, hangars, etc., to illustrate these circle truths that has proven to be a major breakthrough in the field of golf instruction. As a writer, Wally has also co-authored seven books with his last best-selling book co-authored with Ken Blanchard titled "THE MULLIGAN." Jimmy Stewart is a former Future Master's Champion, who Peter Thomson, a five time British Open Champion said " a player like this only comes along once every 100 years." Jimmy attended University of Houston on a 4 year golf scholarship graduating with a Business Management Degree and later a Masters Degree from the Thunderbird School of Global Management. In addition to founding the Swing The Circle Golf Schools, Jimmy was a member of the Asian PGA Tour and is a member of the Asia-Pacific Champions Tour and the PGA. Jimmy also headed up Robert Trent Jones II and Ron Fream's Golf Course Design companies as COO and is the Owner & Head Golf Professional of Tayman Park Golf Group, Inc. which operates four golf courses - Healdsburg Golf Club, Ukiah Valley Golf Course, The Fairgrounds Golf Center and McInnis Park Golf Center. Wally created seven hours of video and five creative training tools (the Hanger, the Tempo Ball, the Ruler, the Sponge, the Shaft Bar) to teach the game in his best-selling Maximizing Your Game. Over one half million videos and training aids were sold, improving many people's scores and enjoyment, as well as introducing numerous people to the game. This is a recently developed 75 minute instructional DVD, taking the best of all of Wally's instruction in 50 years in golf and compiling it into a way that takes all of the mechanics out of playing golf, helps you create a routine and learn to play by feel just like the pros. 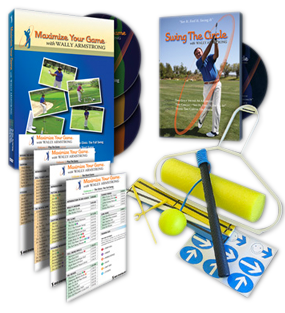 Get Wally's "Total Golf Training Package"